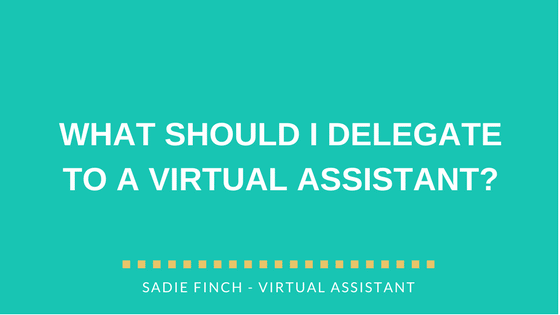 What should I delegate to a Virtual Assistant? In the words of Richard Branson “If you really want to grow as an entrepreneur, you’ve got to learn to delegate”. A 2015 blog post on Virgin’s website recounts an interview Richard gave to entrepreneur.com. Talking about the early days of Virgin, he admits lacking crucial knowledge that meant he had to learn to delegate quickly. During those early problem-solving days that require an entrepreneur’s full attention, a newly launched business demands a lot of time, energy and effort to stay afloat. It can be a real struggle to manage the day to day issues whilst also remaining focused on the bigger picture. As you move on, it’s critical that you learn to delegate certain tasks so that you have more time to prepare for the future and discover new ways to progress your company. Often in business, deciding what not to do is as important as deciding what to do. By learning to recognise which tasks you can delegate and how to do so effectively, you’ll be freeing yourself up to concentrate on driving your business forward. This simple exercise will help you to recognise how much of the work involved in running your business could be handled by someone else, giving you more time to focus on the bigger picture. 1. Which tasks do you dread doing? Are there tasks that are essential to your business that are getting neglected because you find them difficult or boring? If you’re feeling guilty about this, you’re expecting too much of yourself. We’re all different and each of us has our own skills and preferences. If something isn’t for you, that’s fine. But – and it’s a big BUT – you shouldn’t let your business suffer because of it. Find someone who can do it; someone who enjoys it, and let them take it off your hands. 2. Which tasks are lengthy? Monitor your working hours for a couple of weeks. What’s taking up most of your time? Is it something you could add to your virtual assistant task list? If you’re going to hire a virtual assistant to help you free up some time, is there one long task that you can leave them to get on with? Something that won’t require constant input from your end? Got something? Great. Add it to the list. 3. Which tasks don’t need to be handled by you? What doesn’t require your knowledge or expertise? Which tasks can you add to your virtual assistant task list with little instruction and still feel confident that they’ll get done right? Which tasks are nameless/faceless tasks that happen behind the scenes? 4. Which tasks are long overdue? What’s the one thing that’s been at the back of your mind for months now? Which tasks have you neglected because they’re not essential, but still important to your business? Maybe an inbox detox or some data entry work? Now that you’ve read the questions through, take some time to consider all the tasks that are involved in running your business. Which can you add to your virtual assistant task list? How much extra time would you get from delegating those tasks? And what else could you do in that time? Seriously considering hiring a virtual assistant? Read the full list of services I offer as a virtual assistant or get in touch if you have something in mind that’s not included. Now that you have a better idea of which tasks you’d delegate, let’s consider how to do it effectively. Even if the desired outcome seems obvious, always include a brief that outlines what your shared goals are. The clearer your goals, the more focused your virtual assistant’s or employee’s efforts will be. They’ll be able to use their time and resources productively and it’ll increase their chances of achieving the best result. Set goals using the SMART system, as illustrated below, and you’ll create clear, achievable goals that everyone understands. You can find out more about how to use the SMART goal setting system on the MindTools website. Be sure to make clear any boundaries or limitations that will affect how the project is completed. If there’s a budget, a strict deadline, or a regulation or law involved, highlight it clearly in your virtual assistant task list as a reminder for when you’re handing over the project. Similarly, if you’ve already tried something yourself and you know it doesn’t work, let your virtual assistant or employee know. Neither of you wants to waste time making the same mistakes a second time. Make sure your virtual assistant or employee has everything they need to be able to complete the job. Teach them how to do it effectively and then give them the room they need to practice it for themselves. It may seem like a lot of work up front on your part and this can often lead many people into thinking it’d be quicker to do the job themselves. In the long run, though, the more time you spend nurturing a new virtual assistant or employee, the more it’ll pay off. Use your knowledge and experience to teach and guide them and you’ll get better results. Some of us struggle with delegating because it means we’ll have to loosen our control over a project. If you’re the type of person who has a particular style of working and your own way of doing things, you’re going to have to adjust your expectations when you delegate. You can’t micro-manage every aspect of the project. If you do, you’re completely missing the point of delegation. If you’ve set clear goals (as discussed above) and communicated the desired outcome well, then it makes sense to leave the process – or how those goals are achieved – up to your virtual assistant or employee. As U.S. Army General George S. Patton once said “Don’t tell people how to do things, tell them what to do and let them surprise you with their results”. Put your trust in those you delegate to and let them find their own way of achieving the desired results. Whilst trust is important, that doesn’t mean you can’t check in every now and again. Consider asking for an update on a given date or a further discussion once they’ve reached a certain stage in the project. Doing this will help you both to know that you’re on the right track (and give you an opportunity to iron out any kinks). Giving constructive feedback is crucial, particularly when you’re in the early stages of working with a new virtual assistant or employee. If they’ve done well, let them know with genuine praise and a public thank you, such as a testimonial. If there’s something you’re not happy with, it’ll only change if you address it. You should, however, be careful to do so in a fair and supportive way. Remember that the aim is to help the person improve. Focus on solutions rather than problems and talk about the situation, rather than the person. Don’t forget that feedback works both ways. Ask your virtual assistant or employee if there’s anything you could do to make their job easier next time. Were your instructions clear enough? Did you give them the freedom they needed to do their best work? Check out the full list of services I offer as a virtual assistant.